You’ll find Saxmundham Museum at 49 High Street, Saxmundham. We’re at the north end of the High Street, towards North Entrance, just before the railway bridge. Short stay car parking is available opposite the Museum, the closest car park with Blue-Badge spaces, is behind Saxmundham Market Place. Public Toilets are located by the car park. 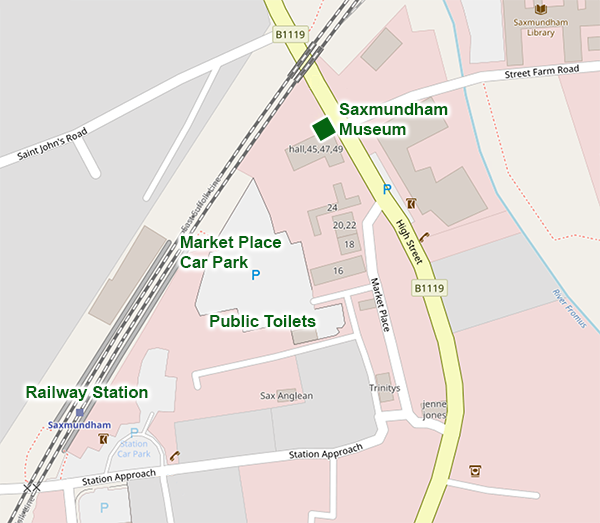 If you come on the train to Saxmundham, the Museum’s a short walk down Station Approach, turn left through the Market Place and head on to North Entrance. There is no official signage to the museum in the town but follow the signs for the old bus station. We are sorry to say that at the moment access into Museum would be diffcult for some people. Home to the Museum is a small-fronted Victorian building, spread over several different levels. The Front door is only 27 inches wide and involves a high step. This makes it difficult for wheelchair access and the pavement oustide is not wide enough for the use of ramps. If you would like to visit and feel you may need assistance please contact us. We shall continue to review our options and possible funding opportunities with the aim to improve access into our Museum in the future. Telephone (01728) 663583 and you will get through to one of the trustees.